Residents and community leaders across the nation are recognizing that high-capacity, regional public transportation services are essential to grow America’s communities in a way that enhances and promotes real estate development. In addition, communities that invest in public transportation attract more visitors and shoppers, public events, commercial businesses, and employers, realizing enhanced development and high economic returns. Communities around the nation are encouraging residential and commercial development near public transit. Transit-oriented development is mixed-use residential and commercial development that brings housing, shopping, educational institutions, and working opportunities within walking distance (usually defined as 1/4 to 1/2 mile) of a transportation hub. In Arlington, VA, development in two Metrorail corridors is concentrated on 6 percent of the land in the county but produces almost half the county’s tax revenue. The city of Dallas had $3 billion in transit-oriented development (TOD) projects in 2005. By 2008, it was $7 billion— associated with an additional $78 billion in tax revenues. In Charlotte, NC, there is $1.8 billion in projected TOD investment, expected to produce an additional $24.1 million annually in tax revenue. 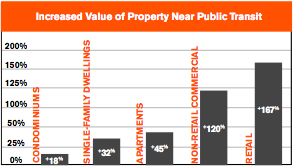 In San Diego, TOD has meant that retail property values have increased 167% within 200 feet of the trolley station. Metro in Los Angeles has a very successful joint program representing more than $4 billion in local development investment. Real estate—residential, commercial or business—that is served by public transportation is valued more highly by the public than similar properties not as well served by transit. A University of North Texas study found that the total value of projects that are attributable to the Dallas Area Rapid Transit light rail system from 1999 through 2007 is $4.26 billion. Area school districts will potentially receive $46 million annually from increased taxable property values. A 2008 Center for Transit-Oriented Development survey of previous research studies found that a property value premium for single-family residential property near public transit was as high as 32 percent, for condominiums near transit as high as 18 percent, for rental apartments near transit as high as 45 percent, for commercial property near transit as high as 120 percent, and for retail property near transit as high as 167 percent. This entry was tagged development, public transportation, real estate values. Bookmark the permalink.